These sunglasses from Bolle will safeguard your eyes from the harmful rays of the sun. The Bolle Swat Tactical Sunglasses are made by the pros at Bolle and will protect the most valuable asset you have - your eyes. Bolle Swat Tactical Sunglasses are the result of developing premium quality sunglasses with top-quality materials at an affordable price. 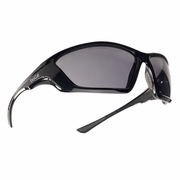 These sunglasses have polarized lenses with black frames.